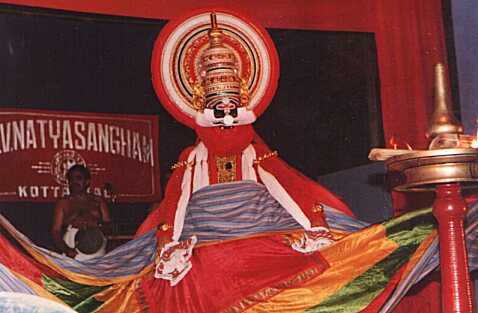 The credit for standardizing the customs and rituals in Kathakali goes mainly to Kaplingattu Namboodiri. Many of the rituals and procedure have obvious lineage to Koodiyattam. Props on stage: Although Kathakali is essentially "visionary" in nature and practically there is no "set" recreating the ambience, a few essential props are used. Thirasseela (Curtain). As in the case of most theatrical forms of the period, Kathakali uses a curtain held aloft by two assistants (Customarily the costume assistants do this job). Traditionally this has to be "a piece of cloth, four feet by five, of a single colour, with the figure of lotus or favourite deity painted prominently". However, the most popular design now prevalent consists of several concentric rectangles of contrasting bright colours. The size has increased and it is not unusual to have the logo or name of the troupe printed across it. Kalivilakku (Lamp): Before the advent of lighting facilities, Kathakali and the like used to rely entirely on the oil lamp placed at the front end of the stage. Customarily, it had to be "having height about a metre, so that it can brighten the face of the artist posing properly in front of it." The lamp is made of bronze and burns coconut oil. The wicks are made from strips of cloth, rolled firmly. Now that better lighting facilities are available, oil lamps have no utility value; but it retains sanctity as an auspicious necessity. Stool: Main purpose of the stool is for the actors to sit on as may be required by the context of the play. However, it is not unusual for some of the characters to stand on it during acting, particularly to indicate height gained as in the case of a chariot ride. Keli is a percussion concert performed just before sunset on the day of. This is envisaged as an announcement that there will be a Kathakali performance, later at the venue. Keli was probably adopted from Mudiyettu (For details see an article elsewhere in CyberKerala), the earliest known theatrical art. Keli is performed on the Chenda, Maddalam(drums) Ilathalam and Chengila (the cymbals & gong). Almost immediately after the Keli, the main artists of the play will prepare for Chutty(the facial make-up). It takes from one and a half to two hours depending on the type of characters. There are a few Items performed before the designated play of the day starts. If Kathakali is the only item for the night usually the lamp is lighted at about eight o'clock. Traditionally this is done by a costume assistant, using a wick lighted from the green room lamp. Arangukeli is a brief percussion item, more like an auspicious ritual. Only Maddalam gong and the cymbals are played. Maddalam perhaps represents "Dundubhi" the large drums of ancient times, which was considered auspicious. Formerly a junior artist used to perform salutation for Lord Ganesha while this item is in progress. As the Arangukeli or Kelikkai gradually fades out, the curtain is held aloft by two persons and the singers begin "Vandanalaslokam", i.e., the hymn praising the favourite deities. Thodayam. One or more actors, mostly junior artists, in the traditional costume worn during training perform this pure dance sequence inside the curtain. The lyrics contains supplication to the various gods of Hindu mythology. Although Thodayam is a beautiful piece of dance, containing dance sequences to the beats of percussion performance in all the four rhythms used in Kathakali (Chempata, Chempa, Atantha and Panchari), now it is rarely performed on stage. Purappad follows Thodayam. Chenda joins the percussionists from this point only. This was originally introduced quite in the lines of "Nandi" of Sanskrit drama, to indicate what is in the offing; that is, to give the audience a clue about the story to be presented. A few lines of verse added in the beginning of many "Aattakkathas" (scripts) are indicative of this. The main characters, mostly hero and his spouse, used to perform Purappad. Soon this item was detached from the play. It became a ritual and as it exists now mostly it is performed by junior artists dressed as Sreekrishna, sometimes accompanied by Rukmini or Balarama and Subhadra. In this form it is assumed that the gods on being pleased by the worship during Thodayam are joining the audience for witnessing th performance. Purappad is their blessing for the performers and audience. The most common lyrics for Purappad is taken from the story "Rajasooyam" and is in praise of Sree Krishna and Sree Rama. Melappadam is a percussion concert intended mainly to show their grade of performance. It is a veritable feast for those who are musically inclined. It develops like a Raga-thalamalika concert (Garland of tunes and rhythms). The lyrics used are from Jayadava's Geethagovindam, perhaps in memory of Ashtapadiyattam, a forerunner of Ramanattam and Krishnattam. After Melappadam the "play" starts. There is one more ritual associated with the first entry of characters other than "Pacha" and "Minukku" (regal and gentle). This is known as "Thiranokku", literally, looking over the curtain. For characters of royal pedigree, this item is accompanied by few props resembling regal pageantry. Unlike in most performing arts, the make up and costumes in Kathakali are not exclusive to each character. It is divided into four groups based on the general nature and behavioural aspects of the characters. Thus noble and heroic persons with only exemplary virtues fall into one category, named Pacha (Green). The main feature of this class is the predominant green paint on the face, fringed with paper flanges. Sreekrishna, Sreerama, Pandavas, Karna etc belong to this category. A subtle variation of this can be seen in Pazhuppu (Ripe). For characters like Lord Shiva, Agni, Balarama who are known for their wrath in addition to noble qualities, the green paint is replaced by saffron. The second category is called Kathi (Knife). Named so due to the knifelike design close to the nose, painted in red in most cases and in black for Yama the god of death, indicative of Thamoguna (Black disposition). Depending on the characteristic disposition, there is another variation in Kathi. For a character of romantic disposition superimposed on inherent daring the design is short (Kurumkathi). Ravana, Duryodhana, Sisupala, Narakasura and Keechaka fall into this category. For those who are to act only as a "strongman" the design is bigger and is called Nedumkathi. Yama is an example. Minukku is the plain make-up without chutty employed for female characters and Brahmins. Chuvanna Thadi (Red beard) is a term used for demon-like make up for extremely villainous characters with fierce nature. The chutty and facial paintings are quite intricate. The headgear is very large in size. A large beard, red in colour is attached to the chin. Dussasan, Jarasandh, Bali & Sugriv appear in this make-up. The general colour of the costume for the upper body is red. All the red hue in this is replaced by black or blue for Karutha Thadi. Kali is an example. Vellathadi (White beard), contrast is reserved for extremely good characters. The make-up is entirely different. The head gear resembles a large hat. Hanuman is the best example. Kari (Black) is the make-up for rude and crude characters like Nishadas. The head gear is like an inverted cone with its apex chopped off. Cholliyattam: This is the part of Kathakali Acting where the actor enacts the dialogues following the lyrics being sung by the singers. The acting traditionally should be "word-by-word". Depending on the tempo, there are three types in Cholliyattam. Pathinjattam is extremely slow and here all Mudras (hand gestures) are displayed in detail, to academic perfection. Usually romantic scenes at the outset of the plays are set in this category. While for a comparatively new viewer it can be painstaking ordeal to watch a Pathinja Padam, it is sheer delight for the connoisseur. Cholliyattam in medium tempo is more commonly used. Here the acting will be more quicker, taking a sentence at a time. In scenes like battle, confrontation etc.. the tempo rises to real rapid. The hand gestures are in quick succession. During cholliyattam of female characters Chenda is not played except in very few cases where the character is extremely exited, and the tempo is rapid. Idakka is played instead for female characters. The accompanying music comes to logical finishing, when their cycles complete, with a 'piece' known as 'Kalasam' played on percussion instruments. This has been turned into an advantage by the actors by performing a pure dance, called by the same name 'Kalasam' . The mood of this dance always matches that of the character. There are several variations in 'Kalasam' called, Iratty, Vattam etc.. The lengthiest among these is Ashtakalasam, traditionally performed only by Arjuna in Nivatha Kavacha Kalakeyavadham, to indicate the extreme state of exhilaration he was in when he was honoured at the hands of Indra, the King of gods. These days, however, this dance sequence has been adapted into other stories too, for example, Kalyanasougandhikam (Hanuman) Subhadraharanam (Balarama & Krishna), Lavanasuravadha (Hanuman and Lavakusha). There is a slight difference in style of performing Kalashams between male and female characters, obviously to suit the basic nature. Ilakiyattam: Often the end of each act is marked by acting without vocal support. These are called Ilakiyattam. Reminiscences, narrations, casual remarks, preparations for journey or war, teasing etc.. are not unusual. This item is often used to enact portions of the story left out by the lyricist. A fair knowledge of the language of 'Mudras' is essential for enjoying Ilakiyattam. Hence, while veterans enjoy it thoroughly, new comers panic during these dump acts. Although the actor is not bound to follow set patterns, generally the content of Ilakiyattam follows a predetermined plan. There are mandatory sequences in many stories. The most popular one is Kailasodharam and Parvatheeviraham" by Ravana in Balivijayam. There is one story where Ilakiyattam takes centre stage. Ravanolbhavam. Here except for the start and finish, the entire act is without vocal support. This story is considered as the acid test for not only an actor, but also for the percussionist (Chenda). No wonder, Kalamandalam Ramankutty Nair, who is considered an all time great in this role, stopped performing it after the demise of the Chenda Maestro, Kalamandalam Krishnan Kutty Poduval.